This Set of Flexible Pet Boots will act as a good partner for them, protecting the paws against hurt from sidewalks, asphalt, grass etc. The sole of the waterproof durable dog boots is sturdy, flexible, skid-resistant and allows the boots to be used indoors or outdoors, in wet and dry, hot and cold conditions.They are sturdy enough to withstand outside play, and protect your dog's paws from stones, dirt and mud. Wide split seam top opening which makes very easy and quick to put on the dog shoe. 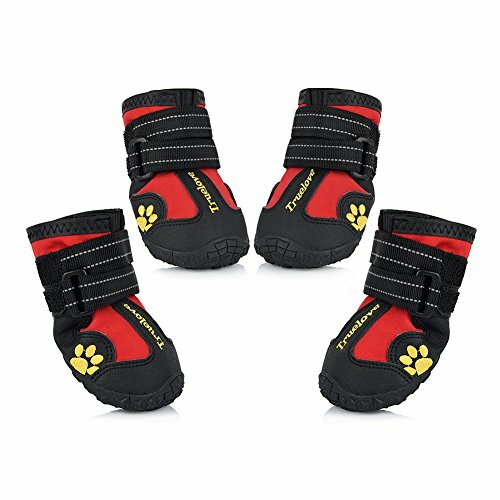 The Dog Shoes are Fastened Firmly by 2 Velcro straps, which are long and adjustable, capable to prevent slipping off and supply a customized tightness for secure closure. The reflective Velcro strap also keep dog safe at night. For Cleaning, The dog shoe are hand washable and dried naturally in the air. For storage please keep the dog boots in a dry, dark, and relatively cool place.Kindly Attention:Though the soles are waterproof,the dog boots can not be applied in deep water or in sands, because there may be water or fine sand seepage through sewing needle holes. 1,Place the paw on a piece of paper and press down on the top, mimicking how the paw spreads when the dog is walking. 2,Mark the left and right sides on the paper and measure the distance between the marks. 3,The width of the paw should be smaller than the boot size chart. Made of tough, water resistant material, capable to keep debris out, and bring more comfort and cool to paws. Flexible,skid-resistant and waterproof sturdy soles, well provide traction and offer serious paw protection in wet and dry, hot and cold conditions. Measure paw width for best fit. If the paw is in-between two sizes, select the larger size. See size chart with actual size of pet boots. If you have any questions about this product by Petacc, contact us by completing and submitting the form below. If you are looking for a specif part number, please include it with your message.